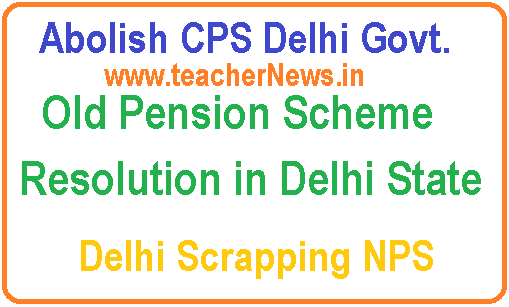 Abolish CPS Delhi Govt | Old Pension Scheme Resolution in Delhi State - Delhi Scrapping NPS : Abolish CPS and Restore Old Pension Resolution Adopted by the Legislative Assembly of Delhi. Legislative Assembly Secretariat National Capital Territory of DELHI Old Secretariat, Delhi-110054 No. F. 22(3)/Resolutions/2015/LAS-VI/Lcg./ Dated: /11/2018 Resolution adopted by the Legislative Assembly of NCT of Delhi to call the attention of Hon'ble Deputy Chief Minister to abolish National Pension System (NPS) and reinstate the old Pension System in the interest of lakhs of Government Servants Delhi Govt Old Pension Scheme Resolution - Delhi Scrapping NPS. Taking note of the negative consequences of the anti-employee National Pension System (NPS) that is imposed on the Government Sermon's by the then NDA Government 10 2004 and sustained by the UPA-I. UPA-II and NDA-11 Governments. Imposes draconian restrictions on withdrawals from pension find, allows the insurance companies to exploit employees by way of forcing them to buy annuity for minimum of ten years even after retirement, and runs contrary to the spirit of welfare state to enshrined in the Constitution. Given the fact that the pro people and welfare oriented Government of NCT of Delhi is strongly in favors of restoring the rights and privileges of us employees by way of replacing the NPS with the time tested old pension scheme. Abolish CPS Delhi Govt | Old Pension Scheme Resolution in Delhi State - Delhi Scrapping NPS : Abolish CPS and Restore Old Pension Resolution Adopted by the Legislative Assembly of Delhi. Legislative Assembly Secretariat National Capital Territory of DELHI.